Distribution of any abnormalities (focal, multifocal, or generalized). Part 1 of this series—published in the May/June 2016 issue of Today’s Veterinary Practice—reviewed the normal ultrasound appearance of the liver and gallbladder as well as the sonographic appearance of nodules. 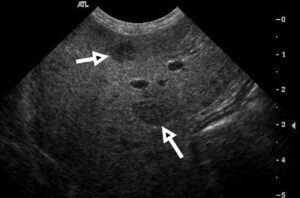 This article reviews abnormalities of the hepatobiliary system found via ultrasonography. The normal echotexture of the liver is a subjective evaluation. The clinician or technician must know how to improve and manipulate the image in order to present a “normal” liver with the appropriate echogenicity. Too much gain results in increased echogenicity and misinterpretation that the liver is abnormal, whereas too little gain results in decreased echogenicity and misinterpretation that the liver is abnormally hypoechoic (Figure 1). FIGURE 1. 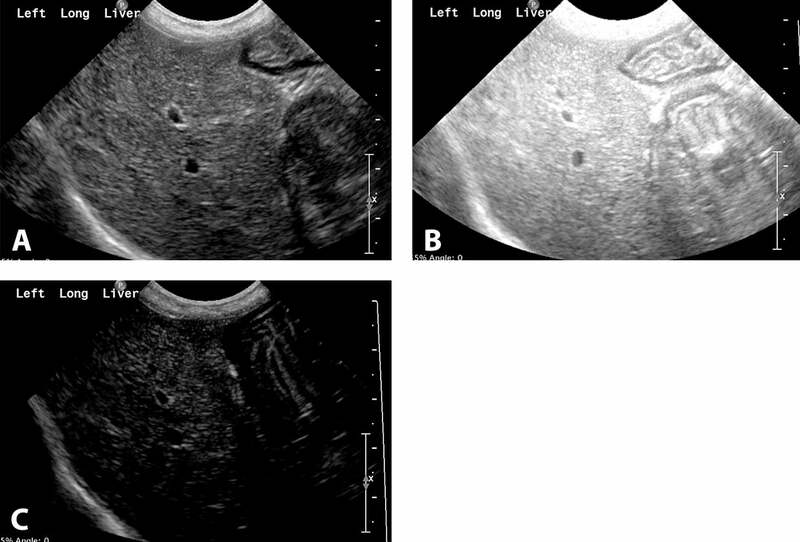 Long-axis images of the left liver lobe in a dog in which the gain is set properly (A), increased overall (B), and decreased overall (C). Diffuse liver disease can be marked by an increase, decrease, or no changes in overall echogenicity (Table 1, Figure 2). In dogs with increased echogenicity secondary to vacuolar hepatopathy, the ultrasound waves can appear hyperattenuating. This occurs when the ultrasound beam no longer penetrates to the depth that would be expected for a given frequency. Typically, the microconvex transducer (C8-5 at 8 MHz) can penetrate to the level of 8 cm. In diseases that cause vacuolar hepatopathies, however, the ultrasound beam is often attenuated to a depth of only 4 to 5 cm. FIGURE 2. Normal echogenicity in a dog (A). Increased echogenicity and decreased portal vascular markings in a dog with diabetes mellitus (B). Decreased overall echogenicity and increased portal vascular markings in a dog with lymphoma (C). Other diseases affect the hepatic parenchyma diffusely but cause no changes in the overall echogenicity of the liver (eg, lymphoma, disseminated mastocytosis, acute hepatitis or cholangiohepatitis). This is why cytology or histology is required for definitive diagnosis. Changes in hepatic size can be symmetric or asymmetric (Table 2); increased size often results in rounding of the hepatic margins (Figure 3). FIGURE 3. Evaluation of the long axis of the left liver lobe. In this dog, the liver margins come to a point (arrow) and are seen ventral (near field) relative to the stomach (A); this finding is normal. In another dog, the margins of the liver lobe are rounded and seen caudal to the stomach (B); this is an indication of increased hepatic volume/size. Ill-defined nodular areas of decreased echogenicity and hyperplasia often indicate vacuolar hepatopathy (Figure 4). FIGURE 4. Long-axis image of the left side of the liver in a dog with pituitary-dependent hyperadrenocorticism. The liver is hyperechoic, and hypoechoic nodules (arrows) are present; these are areas of nodular regeneration. In addition, the liver is hyperattenuating, and the image drops out in the far field. Diffuse heterogeneous enlargement of the liver can be seen as a specific pattern in dogs with hepatocutaneous syndrome (superficial necrolytic dermatitis; Figure 5). FIGURE 5. Short-axis image of the left side of the liver. The liver is enlarged and has a “honeycomb” appearance, which is characteristic of hepatocutaneous syndrome and fibrotic end-stage liver disease without hepatocutaneous syndrome. An overall decrease in echogenicity with an increase in size can be caused by cholangitis or cholangiohepatitis. In these cases, the portal markings appear brighter than usual (Figure 6). FIGURE 6. 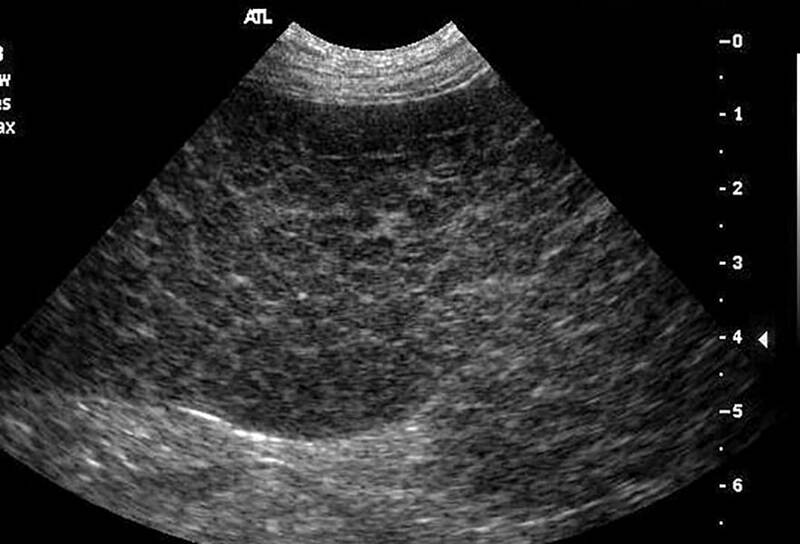 Long-axis image of the right side of the liver with the gallbladder visible (anechoic circle) in a cat with acute cholangiohepatitis. Overall, the liver is hypoechoic, with bright areas representing the normal portal vascular markings. A hyperechoic liver that can be normal or decreased in size with portal hypertension and ascites indicates hepatic cirrhosis (Figure 7). These dogs often have multiple acquired portosystemic shunts in the region of the normal renal vasculature at the level of the aorta and caudal vena cava (Figure 8). FIGURE 7. Hyperechoic liver lacking normal portal vascular markings. The liver margins are contracted, and an anechoic effusion is present. These findings are consistent with hepatic cirrhosis and fibrosis. FIGURE 8. Multiple acquired extrahepatic portosystemic shunts in a dog with chronic hepatic cirrhosis. Color Doppler evaluation of the major abdominal vessels adjacent to the left kidney (A); note the multiple low-flow small vessels adjacent to the aorta and caudal vena cava. Color Doppler evaluation of the major abdominal vessels near the level of the spleen (B); the low-flow small vessels adjacent to the aorta and caudal vena cava can be seen. Other notable areas include the rectal and mesenteric vasculature. These shunts open with chronic portal hypertension. Attenuation is the loss of acoustic energy or number of ultrasound waves traveling at depth. Hyperattenuation results in fewer ultrasound waves interacting with tissue at depth; therefore, the overall image becomes darker as the clinician looks deeper into a tissue. Hypoattenuation describes areas that do not attenuate the ultrasound waves, resulting in artifact and distal acoustic enhancement, and the area deeper to the cystic structure appears “whiter” on the image. Echogenicity is the characteristic internal architecture of a given organ that is based on reflectivity of organ parenchyma. Tissues with increased echogenicity are called hyperechoic and are usually represented by increased grayscale or white, while tissues with decreased echogenicity are called hypoechoic and are usually represented by darker, decreased grayscale values. Areas that lack echogenicity—such as fluid-filled structures, including blood vessels or cysts—are called anechoic and typically appear completely black (again, with distal acoustic enhancement due to lack of attenuation of the ultrasound waves through the fluid-filled structure). The gallbladder is normally found to the right of midline surrounded by the hepatic parenchyma. The cystic and bile ducts are not normally visualized in dogs but can be seen in cats (up to 2–3 mm, Figure 9). FIGURE 9. Long-axis right-sided image of the liver and gallbladder in a normal dog (A). Oblique ultrasound image near the right cranial quadrant in a cat (B). The bile duct (< 2 mm) can be visualized in this cat (arrow); this is a normal finding. The cystic and bile ducts will not be dilated in the normal dog. 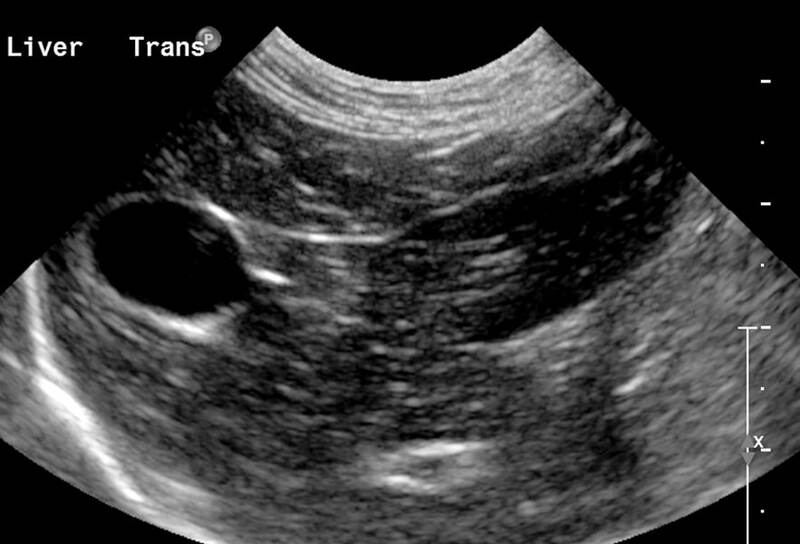 Some echogenic material may be seen within the canine gallbladder (Figure 10). 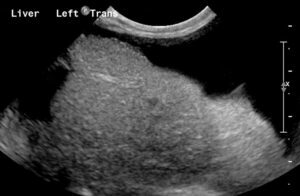 In addition to wall thickening, echogenic material in the gallbladder is not normal in cats and indicates inflammatory biliary disease, such as cholecystitis (Figure 11). Other luminal abnormalities include nonmineralized and mineralized choleliths (Figure 12). FIGURE 10. 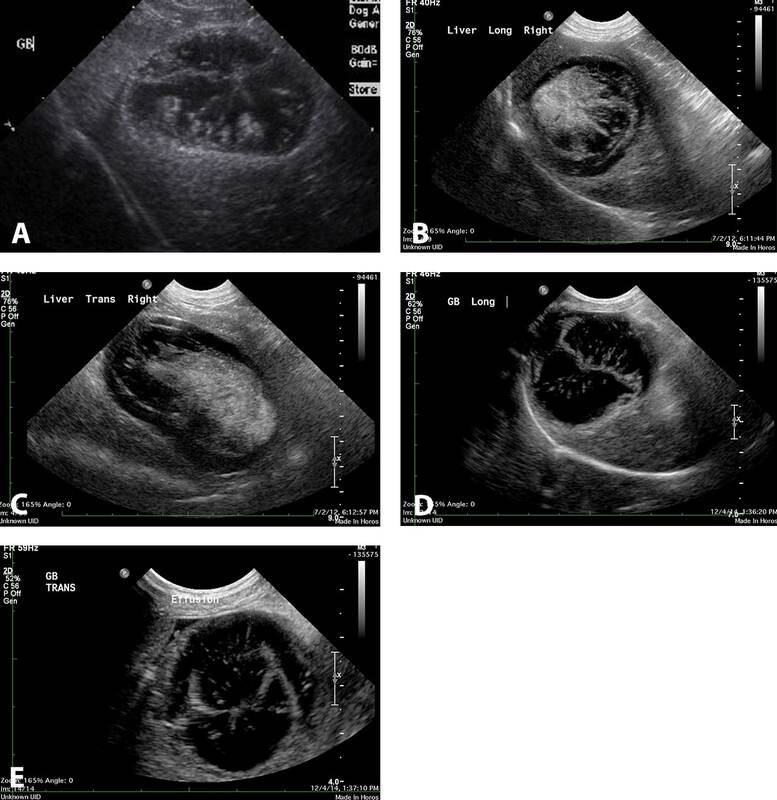 Various ultrasound findings of gallbladder debris (echogenic) in 2 different dogs without other ultrasound signs of hepatobiliary disease. 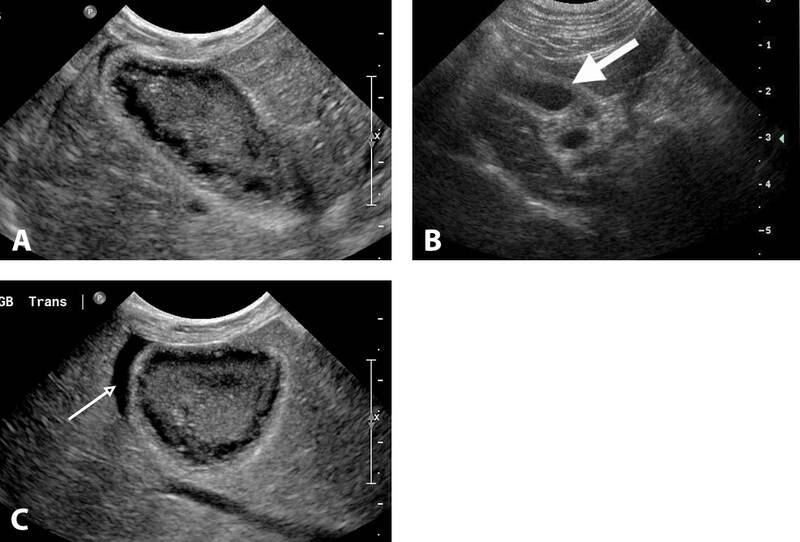 Gravity-dependent echogenic material within the gallbladder (A) and echogenic material with irregular margins within the gallbladder (B). FIGURE 11. Cholecystitis in 3 different animals. Long-axis image of the right side of the liver in a dog with clinical signs of vomiting, weight loss, and icterus (A); the gallbladder wall is markedly thickened with irregular margins. Hypoechoic areas are noted along the wall of the gallbladder consistent with abnormal mucus collections. Hyperechoic material is noted in the middle of the gallbladder, and there is a slight effusion cranial to the gallbladder (small anechoic crescent). Dilated bile and cystic ducts in a cat with cholecystitis and cholangiohepatitis (B); the ductal walls are thickened, dilated, and tortuous (arrow). Transverse section of the right side of the liver in a dog with cholecystitis (C); the gallbladder wall is thickened and hyperechoic and has irregular margins. There is a focal anechoic effusion lateral to the gallbladder (arrow) consistent with inflammation adjacent to the gallbladder wall. This appearance can be seen in dogs with mucoceles and is consistent with “leakage” of bile through a necrotic wall, resulting in a biliary peritonitis. FIGURE 12. Mineralized echogenic material with distal shadowing noted in the neck of the gallbladder in a dog without clinical or chemical evidence of biliary disease (A). Two small mineralized choleliths in the neck of the gallbladder in a dog with no clinical or chemical evidence of cholestasis (B). Mucoceles are an important cause of hepatobiliary disease in dogs. A mucocele is an abnormal collection of bile salts and mucus within the gallbladder that may potentially cause hepatobiliary obstruction, gallbladder wall necrosis, and rupture (Figure 13). FIGURE 13. Multiple examples of mucoceles in dogs with hepatobiliary disease. Long-axis image of the gallbladder with a stellate-appearing mucocele (kiwi fruit sign; A). Long-axis image showing echogenic material within the cranial aspect of the gallbladder with stellate radiating lines of increased echogenicity (B); the gallbladder wall is thickened, hypoechoic, and edematous. Transverse image from the same dog as in B (C); note the hypoechoic, thickened edematous wall of the gallbladder. Long-axis image showing a central hyperechoic line and radiating stellate echogenic lines extending toward the gallbladder wall (D). Transverse image of the same dog as in D demonstrating curvilinear echogenic lines (E); there is a focal effusion noted (just below “Effusion” label). The ultrasound features of a mucocele include variations of mucus collections and ultimate linear striations (stellate or kiwi-like appearance), with the gallbladder completely filled with echogenic material. These striations are secondary to fracture lines between the mucus collections. The gallbladder wall is typically thick and the gallbladder abnormally distended. Gallbladder wall necrosis leads to leakage of bile contents into the peritoneal cavity, with an increase in echogenicity to the mesentery, which is in contact with the gallbladder wall (Figure 14). The abnormal mucus collection can extend into the cystic and bile ducts, resulting in extrahepatic biliary obstruction. Mucoceles have been reported in dogs with no clinical signs; however, mucoceles progress, with the possibility of future wall necrosis and perforation, which should be considered a reason to monitor the lesion or pre-emptively surgically remove the mucocele. FIGURE 14. Transverse (A) and long-axis (B) images in a dog with a mucocele in which the gallbladder wall has undergone necrosis and biliary leakage is present. The mesentery (MES) surrounds part of the gallbladder, and increased echogenicity is associated with the inflamed mesentery. Additionally, a focal effusion is noted in A (arrow). Extrahepatic biliary obstruction in dogs usually results from pancreatitis. Inflammation and edema surround the bile duct, causing obstruction at the level of the pancreas. In experimental bile duct obstructions, the bile and cystic ducts dilate within 24 hours. The gallbladder distends within 48 hours, although it might take a week before the intrahepatic ducts become dilated. The distended extrahepatic ducts are usually tortuous and can be distinguished easily from the portal vein using color Doppler ultrasound. The dilated intrahepatic ducts can be seen around the portal veins within the hepatic parenchyma (Figure 15). Intrahepatic bile ducts have abrupt changes in luminal diameter, irregular walls, and branching patterns when compared with the portal vasculature (tapering luminal diameter, smooth walls, and branches in the midzone to the periphery of the hepatic parenchyma). FIGURE 15. Long-axis, right-sided liver image in a cat in which a distal biliary mass has obstructed the bile duct (A). The bile and cystic ducts are dilated (> 3 mm) and tortuous. Intrahepatic biliary ductal dilation is identified within the left side of the liver in this transverse image (B). The color Doppler image documents normal flow within the hepatic and portal veins. The biliary ductal dilation is seen without flow in the liver. Other causes of extrahepatic biliary obstructions include choleliths, duodenal strictures at the major duodenal papilla, and biliary tumors (Figure 16). FIGURE 16. Transverse image in a cat with a biliary adenocarcinoma inside the bile duct near the level of the duodenum and pancreas (A). The mass is distal to the dilated bile duct and outlined by measuring markers (x and +). The label “distal” is located on top of the dilated bile duct. 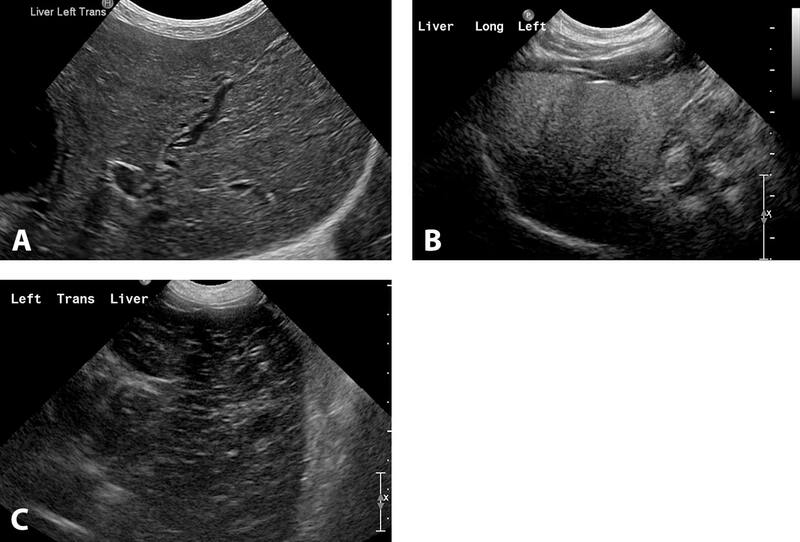 Long-axis image of the liver in a cat with an abnormally dilated cystic duct (arrow) at the neck of the gallbladder with a cholelith in the distal bile duct, resulting in extrahapatic and intrahepatic biliary dilation (B). The hypoechoic circle adjacent to the dilated cystic duct is the portal vein. Cats can develop a condition known as triaditis, which involves concurrent cholecystitis/cholangiohepatitis, pancreatitis, and inflammatory bowel disease. When performing ultrasonography of the liver and gallbladder, it is important to realize that a negative scan does not rule out disease. In particular, hepatic scans can appear normal in dogs and cats with certain round cell tumors, such as lymphoma and systemic mastocytosis. Cytology or histology is required for definitive diagnosis in patients in which these tumors are suspected. Biliary disease is common in dogs and less so in cats. It is incumbent on the novice sonographer to review current textbooks and other sources for further descriptions detailing the ultrasound appearance of hepatic and biliary disorders. Mesich ML, Mayhew PD, Pack M, et al. Gallbladder mucoceles and their association with endocrinopathies in dogs: A retrospective case-control study. J Small Anim Pract 2009; 50:630-635. Kremkau FW. Sonography Principles and Instruments, 8th ed. Philadelphia: Saunders Elsevier, 2010. Mattoon J, Nyland T. Small Animal Diagnostic Ultrasound, 3rd ed. Philadelphia: Elsevier, 2015. Penninck D, d’Anjou M (eds). Atlas of Small Animal Abdominal Ultrasonography, 2nd ed. Ames, IA: Wiley Blackwell Publishing, 2015.